Kiss-lock top closure and a dazzling array of sequins and beads arranged into a peacock feather design. Use the fabric-lined interior of this fashion mini bag to stow small essentials like keys, ID, lipstick, and a cell phone. 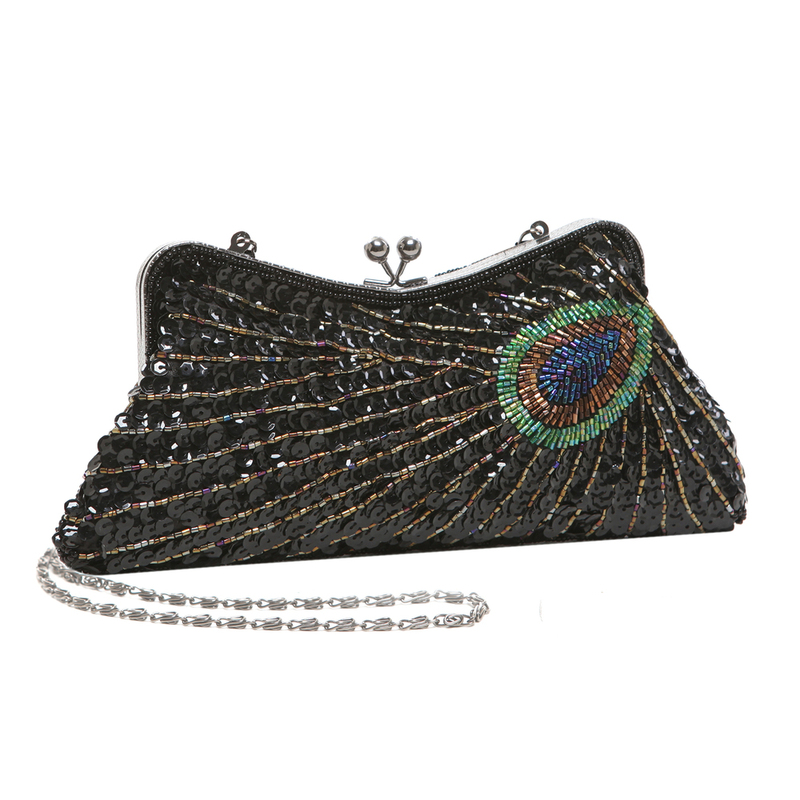 This sequined fashion purse can be carried as a clutch, or you can attach either the short chain handle or the long chain shoulder strap to carry this evening bag on your arm. Approximate Dimensions: Exterior - 10.1" W X 5" H X 1.3" D; Interior - 9.9" W X 4.8" H X 1.1" D; Short Chain Handle - 7.8" handle drop; Long Chain Shoulder Strap - 23" shoulder drop. Dazzling, glamorous style will be right at your fingertips when you make this fabulous fashion clutch a part of your special-event ensemble. 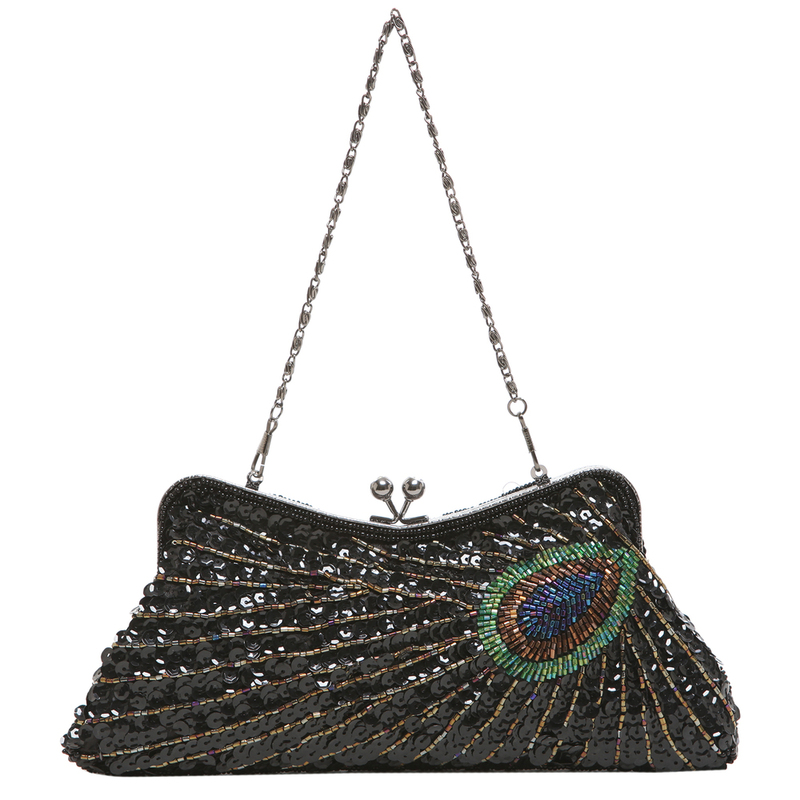 On this evening handbag’s eye-catching exterior, a gorgeous collection of sparkling sequins and beads is arranged into a peacock feather design that will add the perfect touch of bold style to your look. The rhinestone-studded kiss-lock clasp at the top of this sequined fashion purse opens up to show off this evening bag’s fabric-lined interior, which features plenty of space for small essentials like lipstick, ID, keys, and a cell phone. Simply carry this mini evening purse as a clutch or slip either the short chain handle or the long chain shoulder strap over an arm to keep this stunningly stylish kiss-lock purse at your side throughout the day or night.